When White House staffers Joe Mahshie and Brian Mosteller tied the knot Monday, US vice president Joe Biden officiated, at their request. The small wedding ceremony took place in the vice presidential residence at the US Naval Observatory, and Biden tweeted about the event. It was the first time Biden has officiated a wedding, a White House statement said. He got a temporary certificate from the District of Columbia to perform it. While some of his right-wing opponents will no doubt object, Biden’s enthusiastic support for the wedding, and marriage equality in general, comes as no surprise. 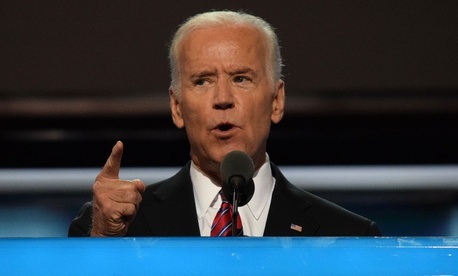 Indeed while Biden has a long list of achievements from his decades in public office, some now believe that one of his chief legacies will be having persuaded Barack Obama to take a political risk by publicly support marriage equality before the 2012 presidential election. Obama became the first sitting US president to ever do so in May 2012, shortly after Biden did the same, and the two won the election six months later. Obama believed in marriage equality during his first presidential campaign, but he claimed he opposed it for political reasons, his former political strategist David Axelrod wrote in a 2015 memoir. Obama would later say his view had “evolved.” Regardless, his show of support in an election year, at the encouragement of Biden, helped put the issue of marriage equality in the national limelight.